Boxing promoter Eddie Hearn says he wants James DeGale to fight George Groves next year, with the winner fighting Carl Froch in the summer. 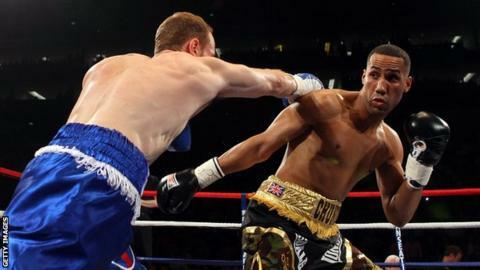 Briton DeGale, 28, lost the first fight of his career when he was outpointed by Groves in London in 2011. "I am sure we can get DeGale and Groves together for a vacant world title," said Hearn. IBF and WBA super-middleweight champion Froch said last month that he "would not get out of bed" to fight DeGale. Froch will lose his IBF crown if he does not face mandatory challenger DeGale, who beat Marco Antonio Periban last month. De Gale has since branded Froch a "coward" for not wanting to fight. Meanwhile, Groves, 26, beat Christopher Rebrasse in September to secure the European super-middleweight title and is now the mandatory challenger for Anthony Dirrell's WBC belt. James DeGale has won 20 of his 21 fights of which 14 have been by KO. His only defeat came against George Groves in 2011. Hearn added: "DeGale can fight for the IBF title and George Groves can fight for the WBC title in very tough fights for relatively small money so why not fight each other? "They are both highly ranked in every governing body and you could say to Carl Froch, take the winner at Wembley at the end of the summer. "There is an opportunity to create a huge fight for British boxing. "The only thing that will stop it is egos because they can't stand each other." Hearn was speaking at a press conference to announce Olympic champion Anthony Joshua's next fight, which is against American heavyweight Kevin Johnson, 31. Joshua has won his first 10 professional fights by stoppage, while Johnson has never been stopped in his 36-fight career. "I see Kevin Johnson as a stepping stone," said Joshua. "I can't see him putting a dent in what we are building. If he provides me with the rounds, that is exactly what we are looking for." Should Joshua win, Hearn wants the 25-year-old to fight Tyson Fury, 26, next year. "It would be a massive fight," said Hearn. "I would like to make it in six to eight months' time when it would be even bigger. This could be a natural fight for the end of the summer."